Aromatic, flavourful and rich in taste with a variety of flavours- that’s probably the only right way to describe the Blue Tokai coffee. And now that Blue Tokai has reached Goan shores, we are dancing like peacocks ourselves. Tokai meaning a peacock (in Malabari) is what inspired this company name. After all Kerala does have some of the most amazing coffee plantations. 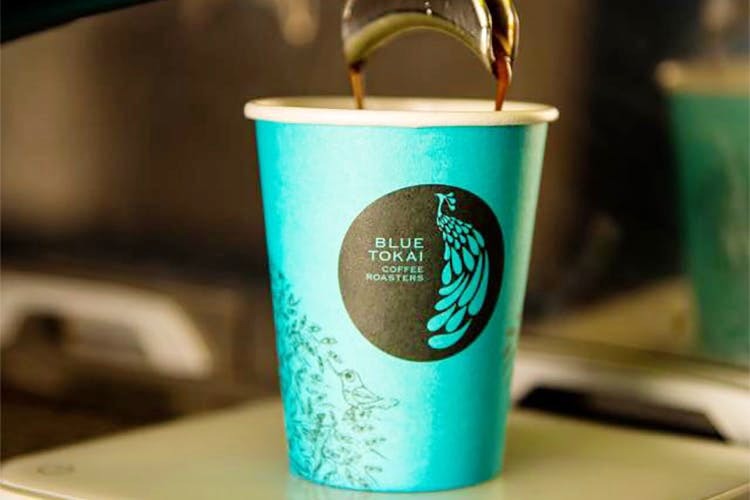 And Blue Tokai ensures that each and every one of their coffee beans is sourced directly from the plantations and then roasted in-house so that they have full control of their quality at all times. After cafes across Delhi & Mumbai, they have finally got their first café in Goa at Panjim, that too in the backyard of the OMO Boutique. Located in the picturesque Latin Quarter of Fontainhas with art on walls, colourful houses and narrow lanes that are a pleasure to walk through, this place is fabulous. With a cool air-conditioned café for those hot days, and small al fresco area in a cozy little courtyard, this one is perfect to spend that afternoon catching up with friends over a cuppa joe. They even plan to have some coffee tasting and other exciting workshops soon. Expect some great blends from various estates across the country. Be it their Bibi Palantation’s AAA or from Thogrihunkal Estate coffe, both of which are available in a medium roast for all of you that like their coffees sweet & balanced expressos. Or then the Nachammai Estate coffee which is a light roast and perfect for when you want to have a filter coffee or maybe a cold coffee. You are sure to find a coffee that suits your taste and you know it is a quality product. Not to mention, that you could even buy their coffee packets or just take their membership to ensure that you are never out of your favourite brew. Plus their Oatmeal cookies were perfect with that cup of coffee. They also serve sandwiches, brownies, corn tarts and other munchies for when you need a quick bite. We’re definitely moving over beer and making our way to Blue Tokai for a hot (or cold) cuppa.